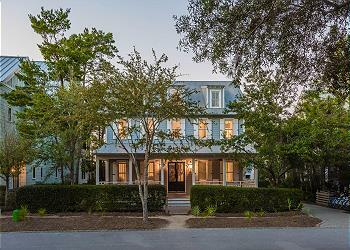 DETAILS: This watercolor home is tucked away in the cottage district, overlooking the lake. The wide porch welcomes you into the home. As you enter the open living space you are greeted with lake views and warm, inviting interiors. This area connects the formal dining area, living room and gourmet kitchen. 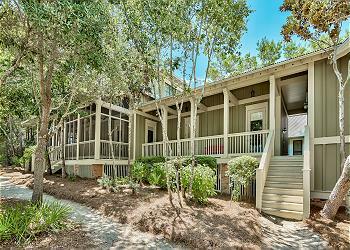 Right off this kitchen you will find a screened porch looking over the lake. The master bedroom is on this floor, it includes a plush king bed and a gorgeous ensuite bathroom. You’ll climb the staircase to find all of the main house bedrooms. The first bedroom on the second story has a full bed, ensuite bathroom and access to the amazing second floor porch. Just down the hall you will find the twin bedroom with porch access and an ensuite. The last bedroom connects the main home to the carriage house and includes a full bed and charming ensuite. Don’t miss the cozy bunk nook featuring Built in cabinets and twin over twin bunk beds. This floor also includes an additional living area with access to a screened porch that includes a ping pong table. The Carriage house includes a full sleeper sofa and full murphy bed, perfect for privacy! What a wonderful week we spent at Louisiana Purchase. We had a big group to celebrate an 85th birthday and this house didn't disappoint. The bedrooms all had King beds, the cribs and bunks all worked well for the little ones, the kitchen was well stocked for meals in house, the icemaker was especially useful, the 3rd floor game game room was the perfect respite for the young adults who wanted to stay up late and the location for a quick walk to Seaside could not be beat. Everyone in the group thoroughly enjoyed the home. This house was the best. It overlooks the nature preserve area of Western Lake. It is on a culdesac and is quiet and easily accommodated our 3 families. 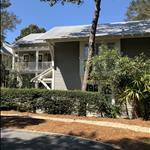 The location is excellent...right across from the tennis courts and a short walk to Seaside. The kitchen was awesome for our teenagers to gather and they also loved the independence of staying in the carriage house. Would highly recommend this place to anyone. I did want to point out that we observed security cameras on the back porch and screened in porch area. It caught us a little off because they were pointing into the room and house vs. externally. Made us wonder if there were others throughout the interior of the home. That certainly didn't detour our fun but I think a disclaimer of some sort would have been a nice add. 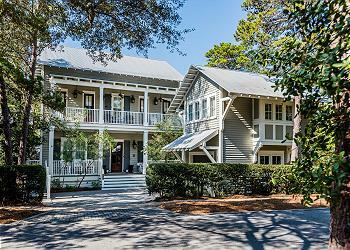 What a fantastic week at 30A! Your home is absolutely stunning and one of the most well equipped. We felt 360 met and exceeded all of our expectations and were very attentive. Looks like the perfect beach day! Thank you for choosing 360 Blue. We hope to see you back soon!